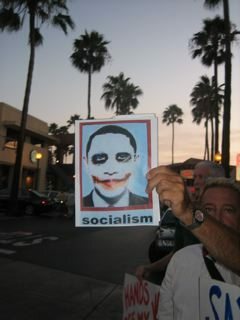 Obama as the Joker is showing up at these town hall meetings. 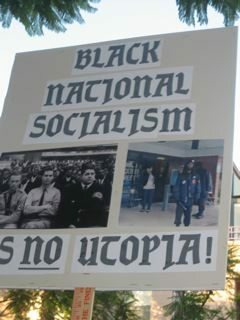 This one was seen at the Susan Davis meeting in Hillcrest on August 11, 2009. Photo: Jason Miller. Originally posted August 13, 2009. Editor: This is the second in Sara Robinson’s series on the rise of fascism in America. See here for the first segment. Why the right-wing extremism must be stopped in its tracks or else we face the threat of outright violence and goon rule. By Sara Robinson / Campaign for America’s Future / August 13, 2009. Writing about fascism for an American audience is always a fraught business. Invariably, a third of the readers will dismiss the topic (and your faithful blogger’s basic sanity) out of hand. Either they’ve got their own definition of fascism, and whatever’s going on doesn’t seem to fit it; or else they’re firm believers in a variant of Godwin’s Law, which says (with some justification) that anyone who invokes the F-word is a de facto alarmist of questionable credibility. Another third will pepper me with missives that are every bit as dismissive — for exactly the opposite reason. To them, anyone who’s been paying the barest amount of attention should realize that America has been a fascist state since (choose one:) 1) 9/11; 2) Reagan; 3) McCarthy; 4) the Civil War; 5) July 4, 1776. For them, my careful analysis and worried warnings are dangerously naive — clear evidence that I’m simply not seeing the full horror of America as it truly is, and always has been, at least since (insert date here). Given this general crankiness, I probably wouldn’t bother with the subject at all — except for that final third who keep me going. From them, I’ve gotten a blizzard of anecdotes, questions, meditations, ideas, suggestions, manifestos and love letters (including lots of link love). The piece sparked a lot of conversation all across Left Blogistan about what fascism is and what it ain’t, and what we need to be watching for. And that kind of thoughtful discussion is exactly what I hoped for. I wanted people to start paying attention. In the post about fascism, I pointed out that the most insidious part of it is that by the time it’s finally obvious to absolutely everyone that these people are dangerously out of control, it’s too late to do anything about it. Early warnings are even more valuable here than they are in most domains. And since futurists are — more than anything — in the business of early warnings, it falls to me to step up there and point out that according to at least a few of the more reputable atlases in the glove box, this looks a lot like the last turn into the parking lot of downtown Fascist Hell. The good news is we’re not yet parked and locked, let alone committed to entering the building. (Which is good, because the doors appear to be all one way, just like in the “Hotel California.”) We’ve still got a few minutes to change our minds, back out of this and go spend our future somewhere else. But we are now actively in the process of choosing, whether we’re aware of it or not. There are things happening now that are setting us on a course that may prove impossible to change. First: The teabaggers must not win this one. Back in elementary school, most of us learned that when a bully learns that intimidation and threats work, he’ll will keep doing more of it. In fact, the longer he goes without comeuppance, the bolder and badder he becomes, and the harder it is to make him stop. Every success teaches him something new about how to use terror for maximum effect and tempts him to push the envelope and see what else he can get away with. Do nothing, and he’ll soon take over the whole playground. And it happens like this for bullies in groups, too. Living in a fascist regime is just living in a town dominated by the Mob, a street gang, the KKK, or a corrupt sheriff. It only takes a small handful of thugs to terrorize people into giving up their civil rights, abandoning democracy and doing what they’re told, just so they can keep their jobs, windows and families intact. The main imperative in life becomes staying off the goons’ radar. All the enforcers need to do is make an horrific example out of one or two troublemakers every now and then — and the resulting fear will keep everybody else quietly in line. Given their colossal investment in organizing and indoctinating the teabaggers, we’d be stupid to believe that this is all going to go away when Congress returns to Washington in September. Having had a taste of power and publicity, these newly empowered mobs are very likely to stick around town and see what else they can do to keep the muck stirred up. Our choice now is stark: knock them back while they’re still new, small and not yet entrenched; or deal with them later, when they’ve got some real power to fight back with, and the cost to all of us will be so much higher. Second: Think nationally, fight locally. The conservatives are running this effort as a national campaign — but that’s not where the real fight is. The terror that fuels fascism is always intensely, intimately local in scale. Fascist goon squads always recruit from the neighborhood — they’re built on people you know. Since that’s where they start, that’s where they have to be stopped. This is why all the best tactics involve community-level action. The high-level fight in Congress and the media is already under way, and the Democratic leadership is fighting it with unusual elan. But anybody who sits this one out because they assume that the folks in D.C. have it all handled for them shouldn’t be surprised when they start getting “special treatment” from longtime neighbors, or discover that they can’t park their car downtown any more without having it vandalized. That’s just the next baby step up from where we are now; and in some places, it’s already started to happen. Winning this means getting out there and defending our community’s standards and boundaries now, while they’re still there to be defended. Third: Brush up on our nonviolent resistance — but leave the heavy lifting and rough enforcement to the cops. It’s true that the only way to stop a bully is to stand up to them. But there are ways to stand up to them that don’t involve getting down to the eye-for-an-eye level. My fear, given the stakes and emotions on both sides, is that union thugs, ACORN activists and left-wing anarchists (who ransacked the streets of Minneapolis and St. Paul during last year’s Republican National Convention) will turn violent, and innocent people will get hurt. If that happens, the radical left will bear the responsibility for demonizing free speech. The Nazis used this kind of victim-blaming to tremendous effect as they built up their party. It’s about the moral high ground, people. Any choices we make must be consistent with our own values, or we betray both ourselves and the country. Standing up for health care reform is important; but before that, the country needs to see us standing up for civil discourse and the right to democratic free speech. Since we’re defending the rule of law, our best tactic is to use that law. 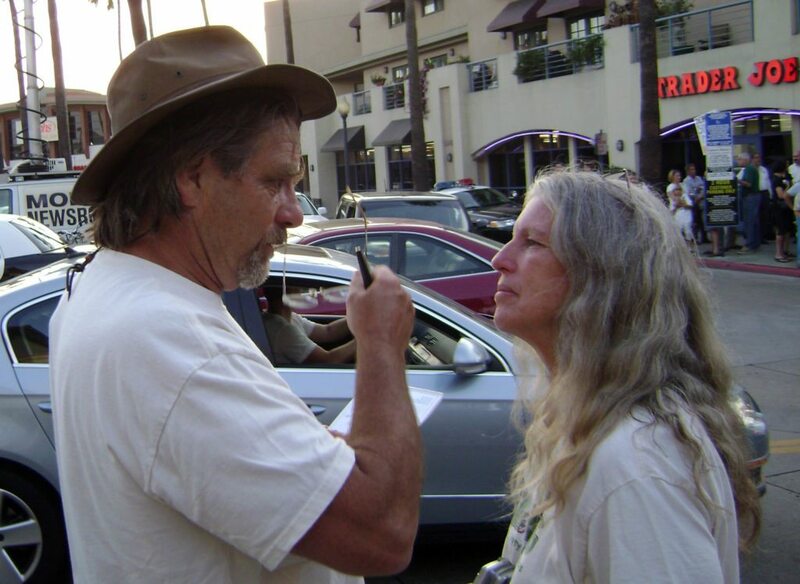 You have a right to attend a public meeting and speak your mind in a civil, respectful manner. You do not have a right to be disruptive or deprive other people of their right to be heard. And most jurisdictions have laws about disturbing the peace and creating a public nuisance — laws, let’s not forget, that the Bush regime didn’t hesitate to stretch until the elastic gave out against people who merely showed up at meetings with the wrong bumper stickers or T-shirts. Since we’re not Bush goons, we can’t go around arresting people who haven’t yet broken any laws. But when people — from either side — cross that line, it’s time for the cops and prosecutors to make the point for us: bullying people in a public meeting (or anywhere else) is illegal and will not be tolerated in this county. Fourth: We need to make absolutely sure that the media get the story right. The teabaggers would run out of power with the flick of a switch if the media would just turn off their cameras. But the cold reality is that this kind of drama is a real ratings-booster. It would be like telling lions to lay off that elephant carcass. Left alone, the media (local news in particular) will turn these people into cultural heroes. They couldn’t turn their backs on this if the republic depended on it. Since we can’t beat ’em, we’ll have to join ’em. The best cure for bad speech is always more speech. This means bringing cameras and documenting everything, getting it up on YouTube, and blogging it. It also means coordinating rapid-response letterwriting to the local paper and keeping down-home reporters well-fed every single day with some new theme that reinforces the idea of concerned nonpartisan citizens trying to keep control over their democratic discourse in the face of organized thugs. Since the media are watching, let’s make sure they see it all. Fifth: Support legislators who don’t show fear. The Democratic Party seems to be playing this just right (so far). The leadership has made it known that these noisy, scary people don’t represent the 73 percent of Americans who support health care reform. The GOP is running the risk of being marginalized as not only the Party of No, but the Party of Moonbat Crazy. If you’ve never attended a public meeting in your life, August 2009 is the month you need to start. Your congressperson’s Web site probably lists a schedule, or at least a number you can call to inquire. But that’s just a first step. Do more. Write. Call. Find out where your local congressional office is, and just drop by when you’re in the neighborhood. Tell the staff how you feel — about health care reform, about the teabaggers, about your legislator’s brave stance in the face of this. If they’re showing stress, encourage them to stand firm. A constituent in the office counts for thousands writing e-mails, so an in-person visit is 15 minutes incredibly well spent. One visit or call is good. More is better. Put it in your schedule to contact your representatives at least once a week for the duration, and make sure they’re not buckling under the pressure. Sixth: Shut down the hate talkers. In most parts of the country, the teabaggers are coming straight out of right-wing talk-radio audiences. For hours every day, they’re mainlining raw emotion and toxic misinformation. The basic recipe: Record their shows. Take notes of anything they say that is intimidating, threatening, or aimed at inciting violence against a named target. And while you’re at it, note every single advertiser they have. Often, the CEO has no clue that any of this is happening and will pull the ads as soon as she finds out what’s being done in her name. This has worked extremely well — and quickly — at both the local and national level. Finally: Eternal vigilance is the price of liberty. Even if we succeed this time, let’s not kid ourselves that this is over. The conservatives are investing a lot of money and effort to build a mass movement that is explicitly aimed at destroying a Democratic government — and if we learned anything from the Clinton years, it’s that they’re not going to let up for a second as long as the Democrats are in control. This is our new reality — and it comes straight out of Hitler’s playbook (check out Chapter 6 of Mein Kampf). Their intention is to keep the outrage junkies high by giving them a never-ending supply of new, made-up reasons to act out. When the birth certificate fracas cools, they’re standing by with “death panels.” When that one’s run its course, there will be something else — over and over, every few weeks, for as long as the Dems rule. Which means that even if we win this round, we can’t stand down. We’re going to be pushing back against these bullies, over and over, for the next three to seven years. There are only two outcomes here. Either we get very good at spotting and stopping these attempts at a brownshirt takeover the minute they crop up; or they’re going to get very good at public intimidation and keep ratcheting it up further toward outright violence and goon rule. That’s how it’s going to be for the rest of this administration. The sooner we resign ourselves to the zero-sum nature of this fight, the sooner we can get on with getting good at it. Nice photo of Patty and Frank inside. No worries people health care reform will never get passed. To much burden on the middle class tax payer and plenty of the people that voted for Obama are against it. Obama should put this bill on the back burner or he will become another one termer. hahaha..Thanks Reid, I’ve been worried sick that millions of people might actually have access to health care. Maybe I’ll finally sleep tonight knowing that they’ won’t. And that the people who voted for Obama (who made health care reform a goal during his campaign) are actually against it. My middle class wallet is really happy right now being sucked dry by major for-profit insurance companies and “sick-care” hospital conglomerates (read: Kaiser…Aetna, etc…). You’re a genius. You opened a lot of eyes on this board. Thats funny how Jon can use his words. The people who voted for Obama (who made health care reform a goal during his campaign) are actually against it. When I just said plenty, Keep up the propaganda Jon boy. So help me understand this, Liberals protest war, while conservatives protest health care? Am I the only one confused here? It’s sad isn’t it Abby? The big protest over health care is a sham anyway, and just viewed by the right as an opening to weaken Obama. I would not be at all surprised to learn that most of these jokers are on Medicare, Social Security, or possibly even unemployment, while screaming no to socialization (which most can’t even spell properly. 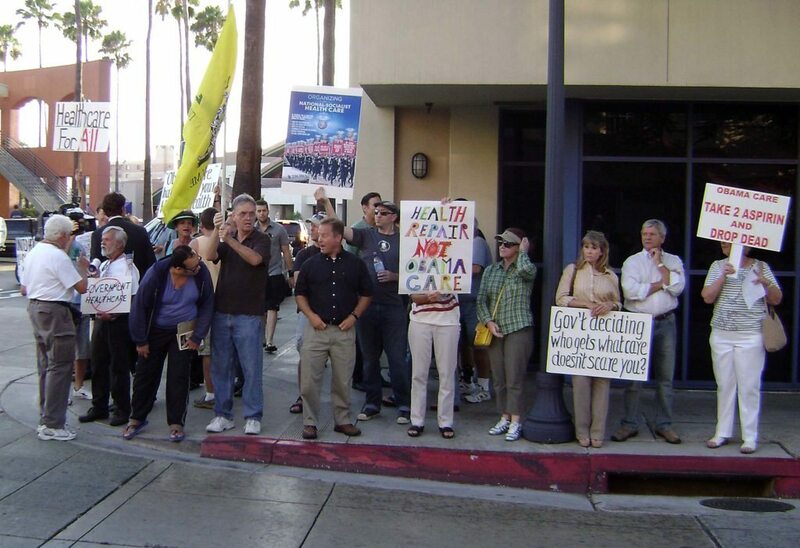 I can’t tell you how many pictures I’ve seen with some moron holding a sign that reads: “No Socilized medicine”). Irony is not in these folks vocabulary. I have a problem with both parts of Robinson’s series, which is that although she makes the proper connection between the ‘conservative’ elite wealthy interests and the growing goon groups, she does not also clearly identify the corruption and compromise of high level Democrats by the same anti-democratic corporate interests. Millions of people who vote Democratic Party and who definitely oppose fascism are going to have to pay attention and draw a line between their loyalty to democracy and their loyalty to elected Democrats (who cannot be counted on to act on principle). Groups like Progressive Democrats of America will need to step up their work to build community level committees to defend democratic rights. And, in turn, all the left groups that are outside of the Democratic Party are going to have to find concrete ways to work with their neighbors who are inside the Democratic Party. are you talking about the ob rag and the people who write and make comments in this quote of yours? Danny – echoing bodysurferdude, I also am confused about what you said. You know, you can’t just “jump back in the mix” without taking in account the social context. And put away yur sword, dude, you are among friends. Have you already forgotten about OBGO and the majority we had on the Board for years? Or perhaps that is what you refer to, sir, – either way, explain yourself, oh my brother. Hey Abby help me understand this, liberals protest pro life then the next day there protesting against the death penalty ? you’re not the only one confused. You are assuming a lot Reid, not everyone who is pro choice is anti death penalty. But still better than the right’s “every life is sacred, until they are born, then you’re on your own” policy. OK,OK,…I dihna mean to tip anybody’s rice bowl! In fact if it wasn’t for the Raggers I wouldn’t have gotten into the remix that’s OB now! You’re right Frank, here I am spreading disunity before there is even an issue to organize around. I was wrong. My apologies to B.S. Bob and anybody else on the ‘Rag. – I was wrong and should know better (but obviously don’t)- We all have a purpose within the context of a post Bushit OB just as OBGO did in last/first days of WJC/GWB (I haven’t forgotten) and I want to make a positive contribution to that good purpose. Admittedly, my past history was contentious both vis a vis OBGO and the Save OB Coalition. I dont want to turn my back on that part of my life but I sure as hell dont want to repeat it either! Frank, more than being amongst friends, I’ve come to accept the fact that (for the most part) I’m amongst family. I hope y’all accept my apologies and my future conduct in that tolerant and loving manner. Otherwise just tell me to put a sock in it! Hey Abby, your right and I happen to know liberals that support the death penalty (god bless then) but I also know conservatives that are not nazi war mongers. Obama puts out a 1000 page plus health care reform bill and his own party did not read, but are ready to pass it , what ever happened to that great old saying QUESTION AUTHORITY. Obama is still part of the most untrusted people in the world POLITICIANS. Rob – your “government which governs least, governs best” means you’re either an anarchist or a libertarian, yes? If you’re an anarchist, this saying is akin to the old anarchist theme of no government is best, and it was based on an eternal optimism about human nature. A human nature that sees people as inherently good and who would not harm their neighbor and only want what’s theirs. They would rule their society through communal and consensus forms of decision-making. This is also where the “question authority” current comes from. Many folks on the left are anarchists if you scratch their surface. It comes from years of living in authoritarian-democracies ruled by non-democratic business, military and professional elites. Is that you, Rob? There’s another current running through American politics: the libertarian thread – and this thread bends a couple ways – to the right and to the left. The right thread lays down essentially a rationale for unbridled capitalists and corporatists who want no government interference in their business of raking in profits at the expense of the little guys and girls. If the large capitalists had their way, they’d still be employing children fed on cocaine to make them work longer as they did in the early parts of the 20th century. Unions would be outlawed, there would be no government inspection of our meats, foods, drugs, construction projects, no cheap mail delivery, no safety nets for the old or infirm, no unemployment insurance, no workers comp. Yet, as part of their contrariness, these libertarians with a rightwing bent do want an enlarged Pentagon and huge militaries and navies to protect their offshore investments (read empire) and they want government agencies that spy and keep down people who want unions, government inspections, safety nets, child labor laws. These people are often identified with the modern Republican Party; they solidly backed George W Bush. Libertarians with a leftward bent – they truly don’t want a large Pentagon or military budget and presence – they opposed the Iraq war, they favor marijuana legalization, they simply don’t want anything large – corporations or government to have any control over them. Live and let live. These folks don’t organize themselves very well and are not a very strong political force. In the end, we need government, despite the optimism of human nature, in this current epoch of history. Because we do not have a very democratic economic system, the people who make up the bottom rungs of society need protection from the corporate elites’ excesses – like wars, anti-union attitudes, corruption, etc. Under this form of capitalism, the people need safety nets – like unemployment, medicare, and other protections. The comment section would not take my full rant, so I had to break it up into 3 parts – sorry! hahaha….Well, I for one enjoyed the rant. It just kept coming! Geez, I gotta get some actual work done now. Hey Jon, big word had to look it up and I’m with you on that one. But I cant remember a delusional theist that ever was an american Pres. Obama was the one in some wild hate and blame the white man church. He maybe just what you’re talking about and that is worse than a politician. You probably think I’m a Obama hater but I’m not. All i said is if he’s heath care reform fails so does he, stimulus package so far a failure, cash for clunkers failure (except for japan) he’s bailouts, failure. He’s batting a 1000 when it comes to failures. Well then you’re batting 1000 when it comes to writing incoherent sentences. But before I go all postal on you for butchering the English language, let’s back up that Rush Limbaugh talking-points train a minute. You can’t remember a delusional theist ever being Pres??? Well, let me jog your memory…we just suffered through 8 years of the worst born-again whack-job president in our history. How short-term is your memory? People voted for Bush simply because he was anti-choice and pro-death penalty. Bush put the fun back in fundamental for these folks. He opened up a Pandora’s box of gun-toting, bible-thumping neo-fascists that now can’t handle a secular moderate black man being in charge. That’s why groups of middle-aged and older white men and women scream crazy things like “I want my country back!” at town hall meetings. Tell THAT to the Native Americans you morons! (thank you daily show for that one) And for someone who claimed to be “Pro-life” (which is a very subjective description of an ideal) he sure didn’t have a problem invading a few muslim countries while in office and sending 1000’s of our country men and countless Iraqi and Afghan citizens to die in illegal wars. I’m not excusing the rhetoric of Obama’s former pastor. He said some pretty dumb things, and I think most churches are really just a front for hate speech and fear mongering anyway. So I’m not going to argue with you over that. Jon, is Jesus the same as Ali to you or not. And is Obama really a black man. Last I heard he was half white and raised by whites. And then you mention the word muslim try to separate that from delusional theist. And yes I admit my english is bad but it seems I got my point across to you. You seem very angry.